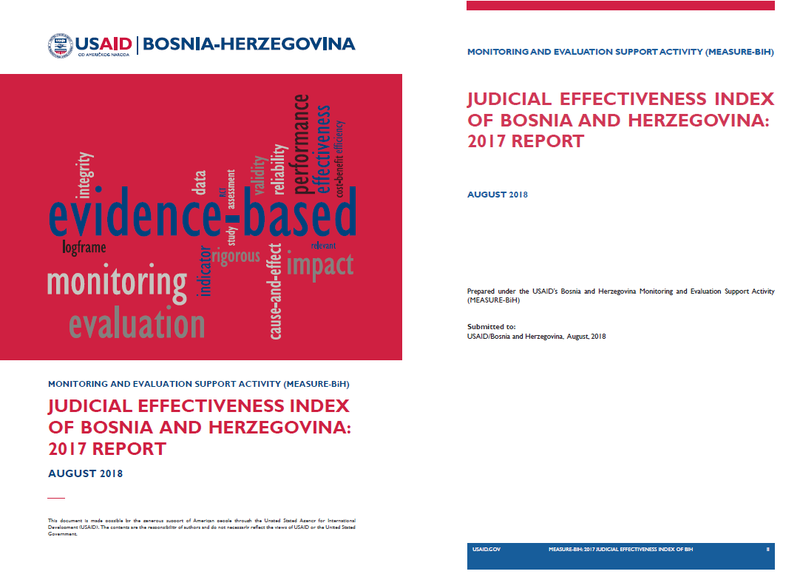 Judicial Effectiveness Index of Bosnia and Herzegovina (JEI-BiH) is produced by USAID/MEASURE-BiH on an annual basis to measure changes and analyze trends in the BiH judiciary. JEI-BiH was developed in 2015 in close partnership with the High Judicial and Prosecutorial Council of Bosnia and Herzegovina (HJPC). The 2015 and 2016 JEI-BiH Reports were published by USAID/MEASURE-BiH, and now findings of 2017 JEI-BiH are also available to the public. The main objective of the Index is to track trends in the BiH judiciary over time, with 2015 serving as the baseline year against which progress in future years is being tracked. As in 2015 and 2016, JEI-BiH 2017 used three independent sources of data to derive a holistic picture of the BiH judiciary. Public use data file for the Survey of BiH Judges and Prosecutors is available here, while public use data from the survey of public perceptions is available as part of the National Survey of Citizens' Perceptions (NSCP-BiH) data file (here). Aggregate HJPC data are available in the JEI-BiH Matrix in the Annex I of the JEI-BIH 2017 Report.